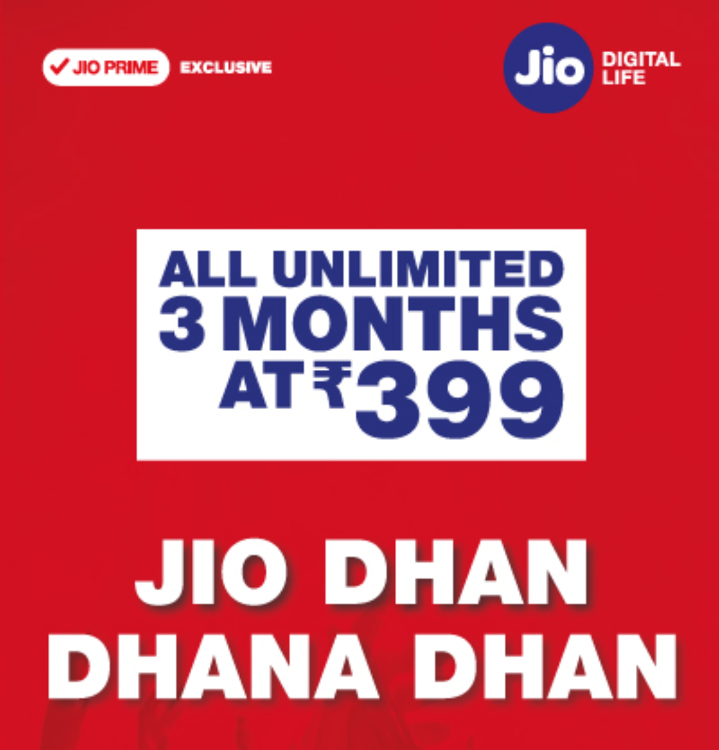 Reliance Jio’s Dhan Dhana Dhan & Summer Surprise Offer is about to end soon and to keep its users engaged with it, Reliance Jio has launched a new Unlimited Calling & Data Plan, the Jio 399 Plan. Under Jio 399 Plan, Reliance Jio is offering 1GB data per day along with Unlimited Local, STD & Roaming Calls and 100 SMS per day for 84 days. Reliance Jio 399 Plan is available for all Jio customers, existing customers can just recharge with Rs. 399 and new customers need to buy Prime Membership before doing recharge of Rs. 399. It is available across India in all telecom circles starting 11th July, 2017. If you are in Andhra Pradesh & Telengana, Bihar & Jharkhand, Chennai, Delhi, Gujarat, Haryana, Himachal Pradesh, Jammu & Kashmir, Karnataka, Kerala, Kolkatta, Madhya Pradesh & Chattisgarh, Maharashtra, Mumbai, North East India, Orissa, Punjab, Rajasthan, Tamil Nadu, UP East, UP West & West Bengal, you can recharge with Jio 399 Plan. Jio 399 Plan July 2017 – Alternative? Jio 399 Plan July 2017 – What for Existing Jio users? Don’t rush to recharge as after Jio Summer Surprise or Jio Dhan Dhana Dhan Promotional Period end, you still have 1 Plan Voucher/Recharge still pending to be applied. Remember Jio had promised that if you Recharge with Summer Surprise or Jio Dhan Dhana Dhan, you will get 84 days Unlimited Calling & Data and the Voucher will be applied once the 84 days are over. Jio 399 Plan July 2017 – How to recharge? You can install MyJio App from here and recharge with the plan. For Online Recharging, visit Jio Website and Enter your Jio Number, select the plan and proceed.